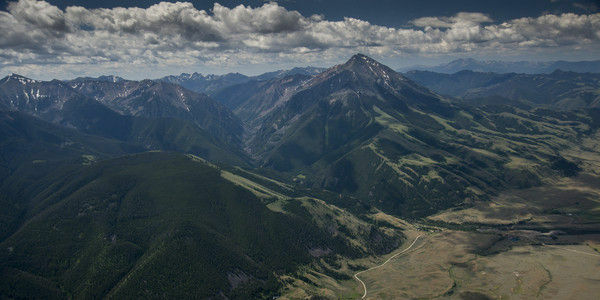 A Canadian mining company, Lucky Minerals Inc., wants to “aggressively explore” for minerals in the Gateway to Yellowstone National Park on the flanks of Emigrant Peak. Emigrant Peak is located in Park County Montana, and is just 17 miles north of Yellowstone National Park. Ultimately, the company hopes to develop “a multi-million ounce gold resource” across three drainages to the Yellowstone River on over 2,500 acres of public and private land. If Lucky Minerals has its way, our community and visitors could lose access to vast amounts of public land in the Absaroka Mountains for hunting and recreation. And the mine’s impact could extend well beyond its footprint. Lucky Minerals plans to extract gold from sulfide-bearing rock. When exposed to air and water, sulfides react to form sulfuric acid in a process known as acid mine drainage. Acid mine drainage is highly toxic to fish and other aquatic life. It is through this process that other hardrock mines in Montana—including the Golden Sunlight, Zortman/Landusky, and Kendall mines—have left a legacy of contamination of ground and surface waters that will last for generations. Lucky Minerals surely hopes to avoid these problems in the Paradise Valley. But if it is not successful and joins the ranks of almost every other hard rock mine in Montana, it will have polluted Yellowstone River tributaries and spoiled public and private lands for recreation, hunting and fishing, and ranching. Park County’s economy and landscape could be forever harmed. That’s why it is so important to stop this project before it even gets started. Please join our growing coalition of community members, business owners and elected officials that oppose an industrial scale mine in the Gateway to Yellowstone National Park and ask Lucky Minerals to walk away from our home. We love Montana’s Paradise Valley. It is where our businesses thrive, where our farms, our ranches and our heritage flourish. It is where our children can still explore wild country just past their doorstep. Most important, it is our home. Millions of visitors from around the world come to experience this special and unique place. They are all welcome, but some activities are not. Recently, it has come to our attention that your company is attempting to conduct exploratory drilling in Emigrant Gulch in Paradise Valley. The Lucky Minerals website hosts documents that detail the hopeful development of over 2,500 acres in Emigrant Gulch and surrounding drainages. We understand that mining is an important part of Montana’s economy and part of our heritage. Still, not all mines are created equal and not all minerals should be mined. There are some places that large-scale mining for minerals like gold, underground or open pit, is not acceptable. Emigrant Gulch is one of those places and is recovering from 150 years of mining history to which we refuse to return. Adjacent to the Absaroka Beartooth Wilderness and just 16 miles north of Yellowstone Park, the gulch supports abundant wildlife and holds key surface and underground tributaries of the Yellowstone River and Chico Hot Springs—the lifeblood of Paradise Valley. Jeopardizing the economy, natural beauty, and vibrancy of our home for the pursuit of gold that is to be used mostly for jewelry is a terrible idea and a bad investment. The strength of our 21st Century economy and our jobs in Paradise Valley and Park County is based on the abundance and cleanliness of the Yellowstone River and her tributaries. Tourists and visitors come here to enjoy Yellowstone National Park, historic Chico Hot Springs, and our many small businesses, restaurants and art galleries. Paradise Valley and its adjacent wildlands offer some of the world’s best back country skiing, hiking, hunting and many other recreational opportunities. People are drawn to this place by the fisheries, the wildlife and the wonderful communities that welcome them with warm smiles and great service. We are doing fine without your mining activity. We invite you personally to come fish our rivers, hike our mountains and meet our community where we are confident you would find the Greater Yellowstone Ecosystem is no place for a gold mine. If you do not walk away from your exploratory drilling and mining activities in Paradise Valley, please know that we will continue to fight you at every appropriate and legal point. The groundswell of opposition to your efforts is just starting. This will prove to be a very bad investment for you and for your shareholders. We look forward to hearing back from you soon. Thanks to overwhelming opposition locally and across the country, mining on public lands in Yellowstone's Gateway has been temporarily halted. Thank you! The US Forest Service announced a two-year time-out on mining on the doorstep to Yellowstone. This was an important step, but we need your help to make it permanent! Add your name to this petition! We have until February 21st to let the US Forest Service know Yellowstone is more valuable than gold!